A thirty-acre estate. Sixty luxurious apartments. Mere miles from the historic town of Lancaster. This is Thurnham Hall, a Diamond Resorts property. If you are someone who enjoys the home-away-from home atmosphere, it’s an ideal timeshare destination. 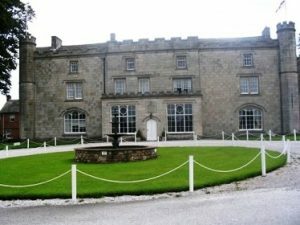 Based around a twelfth century Jacobean manor house, the stunning apartments are decorated to reflect this history. The grandeur of this resort is undeniable, from the magnificence of the Tudor fireplace to the Great Hall itself. You will truly feel like you’ve stepped back in time at this elegant and refined property. Travel and Leisure Group Operations Manager Sarah Bond recently chose to travel to Thurnham Hall for the week. We sat down with her to get an inside look at this stunning resort. TLG: Why did you choose Thurnham Hall for your holiday? SB: I have been to a few timeshare resorts in the UK but had never visited Thurnham Hall. As we have a week on our company’s portfolio I thought it was about time I checked out this famous Diamond Resort! I had heard about Thurnham’s hauntings which have always intrigued me. TLG: You do not own a week at this resort—instead, you chose to rent a week. Would you recommend that people rent weeks before buying? SB: Most definitely. This is the perfect way to try out the timeshare concept and see if it is right for you and your family. You get to experience what it is like to own timeshare without the initial outlay. Then, when you are sure this resort is right for you, you can venture down the path of becoming an outright owner. SB: The facilities at Thurnham Hall are second to none, which is especially important for those on a self-catering holiday. First of all, it is set in the most picturesque of villages and the accommodation is just wonderful. I stayed in a one-bedroom family unit which was ideal for me, my husband and our 7-year-old son. It had everything you could possibly need: full kitchen, two bathrooms, bedroom and living room. Because of this, I was pleasantly surprised by the size of the accommodation, and the standards of the furnishings and equipment were brilliant. The leisure centre has everything you could possibly need: a large indoor heated swimming pool, whirlpool, sauna and fully equipped gym. There is a wonderful restaurant on-site too and reception is open 24/7. SB: The best part of the week for me was simply winding down in a beautiful, relaxing place and having all my home comforts around me. Having access to leisure facilities at my fingertips and generally enjoying everything Lancashire has to offer. Between lovely long walks in the countryside, to waking up in beautiful surroundings with only the sound of animals and birds I had the most enjoyable week at Thurnham. An of course, being only 30 minutes away from Blackpool, we simply had to go and try out the famous roller coasters at Pleasure Beach! SB: I would love to visit Thurnham Hall again and definitely plan to do so in the future. However, my plan is to go abroad for my next holiday. There are timeshares all over the world to choose from and I haven’t yet made my mind up as to which one I will visit next. Due to the standards, quality and attention to detail offered I will always opt for timeshare accommodation. If you’re looking to buy timeshare at Thurnham Hall, don’t hesitate in contacting Travel and Leisure Group at your next convenience. You’ll receive first-class service from our friendly staff, who can offer you weeks at over 50% off developers’ prices. For those looking to sell timeshare instead, we provide comprehensive selling advice and recommendations. Furthermore, all of this comes from over two decades’ worth of experience in timeshare resale.